Download eZ toilet (previously shitmaster) to search and add public toilets nearby. Want to use a toilet really bad. Are you searching for a toilet in the middle of a crowded city, in the wee hours of the night, at a club, during a house party or at an unknown location, then this is the right app for you. eZtoilet is an app designed to cater to the need of relieving yourself so that you carry on with your life without any stress. You can search public toilets near you by just tapping the toilet button. This app uses data given by public. 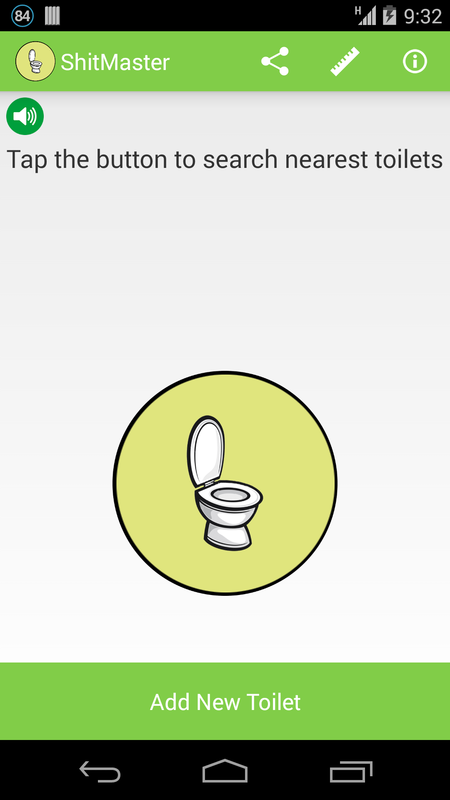 By clicking on add a toilet button, the toilet location is uploaded on our server. This means that you have a responsibility to add genuine public toilets so that others don’t get inconvenience. In other words this app is for the people and by the people. You can also choose the scale of distance which will define your search area. There are five results to the nearest toilet. You can also flag fake toilets. **Disclaimer- Toilets are added by users,we cannot guarantee the accuracy.